Give your guests a distinctive favor that is truly your own with these charming, and unique, candle favors. From Fashioncraft's Silkscreened Glassware Collection, each favor measures 2.5" tall x 2" in diameter, in a classic shot glass/votive holder shape. Each is made of frosted white glass with a pour white tealight candle inside and they're perfectly fitted to be silk screened with amazing accuracy directly on the glass in a wide variety of all occasion themes, designs, colors and titles that match your theme and your personal preferences. 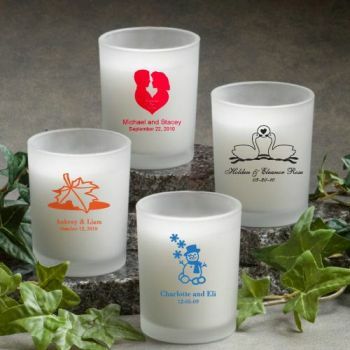 A brilliant selection for weddings, showers and more, these personalized votive candle holder favors come bulk packed. Please allow two weeks for silk screening and processing as well as transit time for shipping to your location. This item no longer comes with a poured white votive candle, instead it comes with a white tealight candle. I had ordered 70 of these for a sweet 16 and they came out nicely, Only thing is they are smaller than they look and the wax is not consistent, some have a a lot and some are only half full, other than that they are good. I am quite proud of them 😃.They look great and arrived much before than expected. The printed colors are very true to what you see online. The mail packaging was safely done. i got this item very quick. It is very nice,i got them to use at my wedding, i will buy again. Very happy with this purchase, I had ordered some wine glassware from another vendor in January, and then I ordered these votives for extras in February, they shipped fairly quickly and I received them before the other purchase, so then I get an email from the other vendor stating the machine is down and they'll work on the order mind you my wedding is in April, so I cancelled that order and ordered from Niceprice favors again for the wine glasses and it came out cheaper than the other vendor, they are suppose to ship March 7th so I'm hoping the same outcome as the votives. Will definitely recommend NicePriceFavors anytime. Everything arrived nicely in great condition. I was very pleased with how they turned out and the price was great! Love the frosted glass candle holders and the printing on the glass was really well done for our son's wedding. However out of the 50 candles we ordered only half of them would burn. The other the wick was too short and the flame fizzled out almost immediately. Very disappointing since it was for a wedding reception. It wAs perfect. Done in a timely manner easy to personalize and order. I was highly pleased with the prompt delivery and accuracy of my order. It arrived in plenty of time for my wedding preparations to stay on schedule. The candles I ordered were the perfect keepsake for my guest to remember our special day! Product arrived on the day it was promised. The candles looked really cute, I will be ordering from them again. Thank you!!! The candles were printed exactly as shown on the website. Every single candle arrived in one piece and packaged very well. There were no printing errors. I am very pleased with this favor! Ordered 250 custom imprinted votive candles for a wedding, and could not be happier - they look amazing. Also, the product was so carefully packed and shipped, that not one piece broke. Can't say enough good things about this company. My inquiry was answered promptly before ordering. The order arrived earlier than anticipated and was exactly what I wanted. I will definitely order from this company again when the need arises. I bought these candle holders as a favor for my niece's wedding. She had been looking for the frosted glass for quite some time and was delighted when I told her that I had found them. She loved them and the fact that they fit neatly into the satin bags she ordered. Very pleased with the final product. We submitted our own custom artwork and were appreciative that the artwork was not manipulated or compromised in any way but reflected just as we had designed it. Votive holders turned out nicely. Only 2 out of 151 arrived broken. Not bad considering all the glass, and I would def blame UPS for the breakage. Disappointed that about a fourth of the candles were only half way poured into the votive. Not happy that we will have to spend additional money to replace the half-pours bc we refuse to give our guests votive holders with candles that only fill half of the votive. On a positive note, the etching on the glass came out nice and the color was nice. Overall, mostly satisfied. I ordered the candles with hot pink graphics which turned out to be much more red than pink and it no way resembled the color chart provided on the web site. Customer service was poor and I was told that is what they consider to be pink. Upon ordering this item I attempted to place an order for a sample and was told they couldn't send me a sample in any particular color. I now realize this was because they did not want to be liable for poor coloring. Also, some of the candle holders were only filled up with a small amount of wax while others went almost to the top. Will never use this company again. From NicePriceFavors: We are sorry that you are unhappy with your candles. To address a few of your points. The color hot pink that we use is a standard color and the same one we have used for many years for many satisfied customers. Unfortunately every computer monitor shows color differently, therefore there is no way for us to know what color you saw when browsing our site. As for samples, it is impossible for us to accommodate specific requests for color and/or design and it has nothing to do with not being liable for "poor coloring" as you describe it. It is simply a matter of efficiency. We actually lose money on sample orders - which is fine since it often leads to a larger order down the road. This is an investment we are willing to make. However, to have someone have search through glasses to find a specific color and/or design (or both) would be too time consuming. Then what if we don't happen to have that color/design available? We would have to pull back the order - contact the customer and see if they will accept something different. I'm sorry, but this is just on feasible. As for the different levels of wax - that is absolutely a valid complaint and something we will discuss and try to correct with the manufacturer. Once again, we are sorry that you were unhappy with your order. The candle holders turned out great. The only negative thing I can mention is the cost of shipping but they arrived in great condition. They arrived relatively quickly.